Visitors to the world-famous RHS Chelsea Flower Show will discover an oasis of tranquillity among scores of busy trade stands. Gloster, one of the world’s largest producers of high quality outdoor furniture, has commissioned an award-winning garden designer to design its stand in the style of a show garden therefore presenting its products in a natural setting. Barry Mayled, winner of two Golds, a Silver and a Bronze medal at previous Chelsea shows, has created a striking design that is a colourful and realistic showcase for Gloster’s revolutionary Eclipse range of all weather furniture. The Eclipse day bed has become an iconic design for Gloster which launched in 2007 scooped an FX International Design Award* and has been expanded in 2008 to include a sofa and armchair. Curvaceous and contemporary and made from a man-made wicker, it incorporates a variety of materials including a sail cloth canopy, stainless steel fittings and ceramic table top. 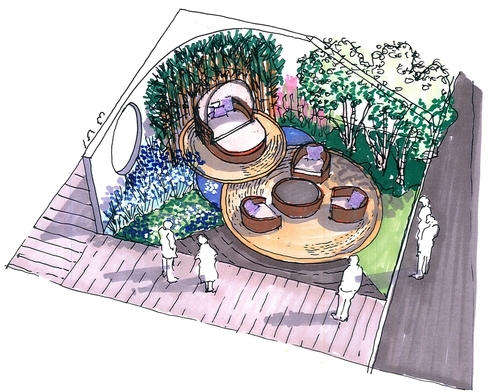 “Eclipse which has been designed to be both sociable and intimate is the inspiration for this small yet equally sociable garden” explains Barry. “The furniture sits on two raised circular decks topped with white coiled rope that appear to float above a gently moving circular pond. These are flanked by curved beds of soft mauve and white planting that, selected for their strong visual contrast to the colours of Eclipse include Periwinkle (Vincaminor), Bell Flower (Campanula) and a sea of Lavender. A group of three multi stemmed Silver Birch (Betula pendula) offer privacy and shade to visitors to the stand whilst a curved row of Black Bamboo (Phyllostachys Nigra) provides a striking backdrop against coloured rendered walls.” Other key features of the design include a large round viewing window and curved walkway. The show, in the grounds of the Chelsea Royal Hospital, runs from 20-24 May. 157,000 visitors will see 600 exhibits that includes trade stands, gardens and over 100 floral displays. Visitors to Gloster’s stand - SR43 - can try out the furniture on display and place an order for any of its 350 product lines. For more information call 01454 631950 or visit www.gloster.com. - * Eclipse won the Public and Leisure Furniture category a the FX International Interior Design Awards which acknowledges both national and international design talent. - Based in the UK, Gloster is one of the largest producers of the quality outdoor furniture in the world with over 350 product lines and a world-wide distribution network. The company designs and manufactures an exciting range of both traditional and contemporary outdoor furniture in a variety of materials including teak, man-made wicker, stainless steel, aluminium and vinyl sling. All products are designed and built to stay outdoors all year long, retaining their beauty and functionality for years to come. Barry Mayled (BSc, B Arch, RIBA, HNC Garden Design) has a clutch of medals earned at the Chelsea Flower Show including two Golds, a Silver and a Bronze. He first captured the attention of the gardening world when he won a Gold medal and Best in Class award in 2003 for his Compass Garden sponsored by The Sir Steve Redgrave Trust. This year Barry is designing The Sky At Night Garden (TR3) in the Roof Terrace Garden category. This press release was distributed by ResponseSource Press Release Wire on behalf of Jasper PR in the following categories: Leisure & Hobbies, Home & Garden, Women's Interest & Beauty, Food & Drink, for more information visit https://pressreleasewire.responsesource.com/about.